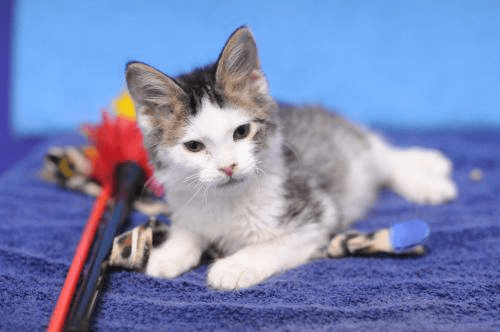 Luey is a very special, former bottle kitten who was born with Cerebellar Hyperplasia (CH) which means he is very wobbly and floppy when he walks. He doesn’t think anything is wrong with him. He may fall, but he gets back up and continues along as if nothing has happened. His food and water bowls must be heavy and on the floor. His litter box must also be heavy, large, and low for him to get in. CH does not get worse with age and may get slightly better. CH cats live a normal healthy life. He cannot get up or down the stairs, but he does try at times to climb onto the couch. Mostly, he needs a level area to run and play. Luey was adopted by a very special family. His new best friend is Jillian and she explained in a letter why she so wanted to adopt him. You see, Jillian and Luey share very similar conditions as she “wobbles” as well. Her family took the time to prepare their home so that Luey would have a safe environment to live a healthy, happy life. Luey loves to play and snuggle! He loves to be held and carried around. He purrs and purrs when you pet and hold him. He is one very happy cat!